WASHINGTON (Reuters) – The head of the North Atlantic Treaty Organization warned the U.S. Congress on Wednesday of the threat posed by “a more assertive Russia,” including a massive military buildup, threats to sovereign states, the use of nerve agents and cyberattacks. “We must overcome our differences now because we will need our alliance even more in the future. We face unprecedented challenges – challenges no one nation can face alone,” NATO Secretary General Jens Stoltenberg said. Saying “time is running out,” Stoltenberg also called on Russia to return to compliance with the Intermediate-range Nuclear Forces Treaty, from which U.S. President Donald Trump plans to withdraw the United States this summer. 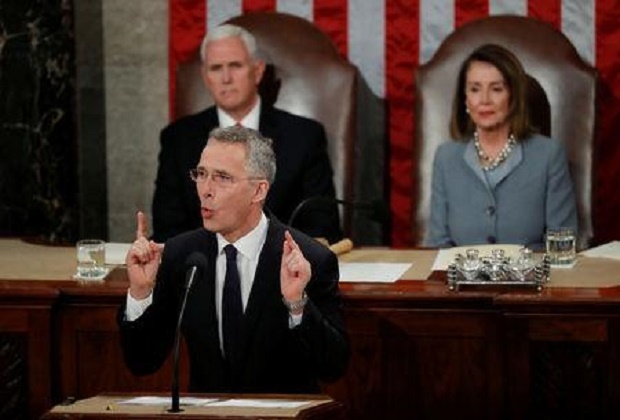 Stoltenberg used his speech to give an impassioned defense of the 70-year-old Western alliance, a partnership he called “the most successful alliance in history,” which has often been derided by Trump since he took office in 2017. Stoltenberg was the first leader of an international organization and the first Norwegian to be accorded the rare honor of such an address. “NATO has been good for Europe, but NATO has also been good for the United States,” Stoltenberg said. The invitation to Stoltenberg to speak as the alliance celebrates its 70th anniversary in Washington was widely seen as a way to send a message to Trump about strong bipartisan support for NATO. The Senate is due to vote later this year on whether North Macedonia can become NATO’s 30th member. Trump has ruffled feathers among European allies by repeatedly saying NATO nations need to pay more for their militaries and ease the burden on the United States. Earlier this year, before inviting Stoltenberg to Congress, House Speaker Nancy Pelosi led a delegation of her fellow Democrats to Brussels, where they sought to reassure European allies that differences over Trump’s policies were mere “family squabbles” and that transatlantic ties remained strong. Members of Congress have also introduced legislation expressing support for NATO or seeking to keep any president from withdrawing from the alliance without lawmakers’ approval. Stoltenberg said NATO member countries are adding billions to their defense spending – $41 billion in the last two years. He expects that figure to rise to $100 billion next year.